From the Editor: The government and other leaders report that the recession is ending and signs of recovery are slowly appearing. Response asked what this means to Jeff Keenan ’83, who shared his passion to make a difference in the world while in any life circumstance, even unemployment. Read Keenan’s first feature, and find out what he’s doing now in this Response update. No job as of yet. I have had several promising job interviews over the past 12 months, but nothing that has ended up turning into a full-time position. At the beginning of 2010, I also started to offer some consulting and contracting services to help organizations (nonprofits and start-up for-profits) with their strategic-plan implementation, their workflow/process efficiencies, and overall operations effectiveness. This has been a blessing, as I’ve enjoyed helping organizations discover that process management – when done effectively – does not have to be bureaucratic, and in fact, can free up more of the organization’s resources to be focused on delivering the mission. As I help organizations in this way, I continue to seek obedience in what God would have me do. My family now seems reasonably well-adjusted to the “new normal” — once we navigated the initially painful stage of adjusting our lifestyle to meet the circumstances. My wife, Debi, and I have attempted to minimize the impact on our four kids as much as possible, and I think (I hope) we have been fairly successful in that attempt. The most difficult challenge (which has been corroborated by many other friends who are “between jobs”) has been trying to contain and reduce the perpetual feeling of always been “on the search,” and the feeling that every action has to somehow be related to creating a gainful compensation opportunity. Evenings and weekends used to be focused family time. But now, even when I’m in the middle of family activities, I’m usually not all “there,” and feel distracted by the as-yet uncompleted assignment of finding or creating a steady income. Meeting with friends, colleagues, and acquaintances (or even meeting new people) used to be a much more person-to-person encounter for me. But now it feels like the work-hunt action item is always on the agenda – whether spoken or unspoken. And for me, that feels very inauthentic, and too often has caused me to lose sight of the person on the other end of the relational interaction. Financially , the family has done OK. Unemployment insurance is an incredible, communal safety net that our country has in place. It certainly doesn’t cover all the bills, but it definitely helps cushion the otherwise sudden loss of income. Our family has also (usually, but not perfectly) been intentional about striving to live below our means, even in times of greater financial blessing. That approach is now affording us some cushion, and has somewhat minimized the financial stress that accompanies unemployment. The toughest lesson has been humility. To begin experiencing humility at its most basic, core level – knowing that we do not, nor will we ever, have ultimate control over our own lives. We have lots of opportunity for short-term or temporary control over many of our circumstances, but we are ultimately dependent on God. We are also dependent on each other, as “siblings” in God’s larger family. This is both an empowering and an unsettling truth, and I’m still trying to spiritually and mentally adjust to this new perspective on what it means to be humble — and, thereby, what it means in my relationship with God and with others. But I suppose that that’s the whole idea of a “journey.” We are each learning these things along the way, and the process is just as important as the destination. I continue to stay active, involved, and strive to make a difference. 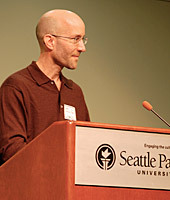 I participate on steering committees for three upcoming Seattle-area conferences on issues related to global poverty – one of which is a Spring 2011, SPU-hosted, Center for Integrity in Business conference. The conference will highlight the various expressions of business in proactively addressing issues of global poverty, and grapple with some of the issues inherent when business and poverty share common intersection points. I earlier contributed to the CIB’s blog, addressing social-impact investing. I also joined the board of InterConnection, a Seattle-based social business. InterConnection refurbishes used computers for low-cost re-sale to underserved communities, both in U.S. and developing countries — thus providing environmental and social benefits for all of us. Finally, I have been privileged occasionally to speak to SPU students in the classroom, and share my story and journey — and the belief that doing good business and reducing global poverty are not mutually exclusive.